the world who are looking for extensive information about bubbles. If you are a student and have a science project due tomorrow, you are probably in for a shock... bubbles are quite complex! 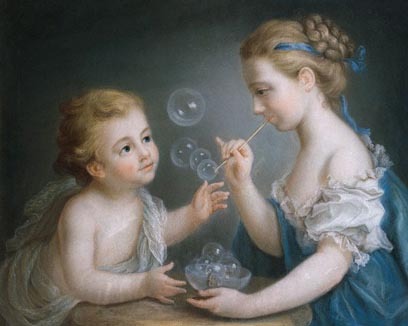 Many of the simpler facts about bubbles can be found within this site, but for deeper knowledge of the math, chemistry and physics, not to mention the cultural phenomenon, of bubbles, you will need to go to a library. You can search the site by keywords if you are in a hurry, but if you can't find what you are looking for, you might try the books and artilcles page for some leads. For fun, check out the music references and video/film pages. These lists are not meant to be all inclusive so if you know of a good book, movie or music refence which is not listed, please send your information along to the bubblesphere via email and we will try to include it. If you have a favorite book or movie and want that logo on an item Personalized By Kate can do it.